Did you know that rabbits and guinea pigs have more in common with a horse than they do a dog or cat? Guinea pigs and rabbits are sociable little creatures that have the ability to turn fibrous food products, such as hay, into energy just like horses. This means they are herbivores. Their digestive system is built to have a short small intestine and a long large intestine and colon. Being herbivorous also requires that these animals eat small meals frequently throughout the entire day. This continual consumption pattern allows the gut to maintain a happy and healthy environment. 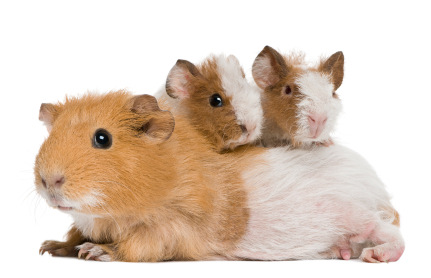 Furthermore, unlike dogs and cats, guinea pigs and rabbits have teeth that grow continuously. They have a set of front teeth (incisors) that are visible by lifting their lips. They also have a set of molars on the top jaw and bottom jaw that are very difficult to see due to a fleshy tongue and chubby cheeks. These two characteristics makes it very important that both rabbits and guinea pigs receive a majority of their diet as hay. The chewing and grinding motion performed when eating, combined with the particular fibrous components in hay, allow teeth to be slowly ground down every time they eat. This is imperative to dental health and indirectly important to overall health of these critters. If teeth are not continuously ground down, it is very common for guinea pigs and rabbit’s tongues to become trapped by their growing molars. This will cause them to stop eating, lose weight and eventually fade away as the gut cannot maintain its healthy environment without a constant influx of food. If you have any questions with respect to your rabbit’s or guinea pig’s oral health, please contact your veterinarian as soon as possible.